In the 2017-2018 church year, Spirit Play, encompassing Pre-K to Grade 1, focused on the theme of “Exploring Diversity: On the Path to Understanding“, an initiative being undertaken by the entire church. “Story” is the basis of the Spirit Play method used in the MUUC program. It is based in Montessori philosophy and Unitarian Universalist content. Children will consider different UU themes at their developmental levels through stories, “Wondering Questions,” and self-guided activities. Spirit Play deepens children’s experience in the classroom by creating understandable guidelines, age-appropriate rituals relating to our faith, and ways to participate in a community. 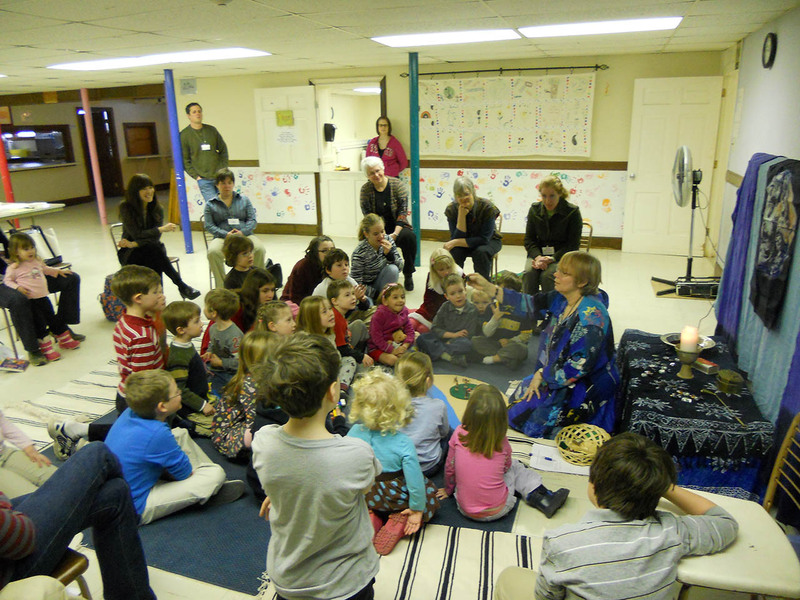 The program utilizes elements of the Montessori Method and Jerome Berryman’s “Godly Play” approach to RE. Each circle time is followed by a time when the children choose their work for the morning. Children are offered a story told with manipulatives, and then they wonder about it together. They are not given definitive answers but are encouraged to figure out what the story means to them. Each story has its own basket of materials kept in a particular place on the shelves so that children may further explore the story. We often use popular children’s stories to help the children connect with the theme. After the story and wondering, the children move on to a work time where each child may choose from art materials or other stories as their work for the morning. This program takes into consideration the multiple learning styles that children have and the multiple ways intelligence manifests itself in their activities. There is a great deal of freedom to move around the classroom during the work time, and then children come back together for a closing circle. This method develops a community of children in a sacred space and gives children the spiritual language to talk about what is most important to them. It also gives them a measure of freedom to choose activities that speak to them.